Discussion in 'Indian Navy' started by SajeevJino, Jan 11, 2012.
by two Iveco diesel engines. UK premises and four in Calcutta. its final stages last week. It is truly a good news, but what would it be armed with? there are no specs on armament. I dont think Hovercrafts are usually armed, may be couple of machine guns. That is it. 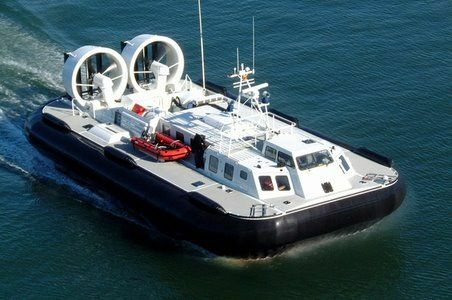 The Griffon 8000TD proven design has led to it dominating the medium lift hovercraft market. 40+ knots with a full payload in zero wind zero wave('0/ 0') conditions. The 8000TD, and its military version the 8000TD(M) , is powered by two water cooled diesel. 8000TD's engines are radiator cooled. Whereas the 8000TD is the same overall length as the 4000TD, it is nearly one metre wider. engines, it is far more powerful and seems to be the preferred choice for military operators. Guard. Depending upon configuration, the 8000TD carries a 8 -10 tonnes payload. direct line (regardless of deep water channels, mud, sand, rock etc.) to intercept. If there is no armament, how the hell are the supposed to guard the coast? Lately the guarding of Coast is not restricted to keeping out foreign fishing vessels but after 26/11 there are variety of threats that are now to be looked into, Further we have the risk of Somali pirates which do venture deep sea too. Is it not possible to make these hovercraft at home? I mean if we can manufacture aircraft carrier, then what is so difficult in getting these up? Surely there must be at least 1 shipyard that is free to build this. Once again, our procurement policy is designed to promote the supplier's economy more than our own.